I decided to test this productâ€™s claims under the optimum conditions: after biking home from work on the hottest summer day possible. Unfortunately, that day never materialized (itâ€™s been a very cool summer), so I decided that today would have to do. Fortunately, despite the lack of cooperation from the weather, my two-wheeled commute left my throat as dry as a five-year-old stick of Juicy Fruit. Resisting the urge to grab a cold one out of the refrigerator, I reached for my pack of Quench instead. This pack (courtesy of the All Candy Expo) is the Fruit Blast flavor, described on the package as â€œa mouthwatering explosion in every pack!â€ This is the chicklet-style blister-pack type of sugarfree gum. Unlike others of its kind, the rectangular, pink-speckled pieces are soft, without the usual crisp candy shell. So itâ€™s pretty tasty stuff, but was I any less thirsty afterward? Well, thatâ€™s difficult to say. The tangy sourness and dissolving crystals did seem to stimulate the flow of saliva in my mouth, helping to rehydrate my parched throat and taste buds. It goes without saying that it didnâ€™t actually introduce any new liquid into my system, making it no replacement for actually drinking something if youâ€™re actually dehydrated, but in terms of reducing the sensation of thirst, it does what itâ€™s supposed to. It couldnâ€™t hurt to throw a pack in your pocket for extended workout sessions â€“ as long as you have a big cold glass of water waiting for you once youâ€™re finished. 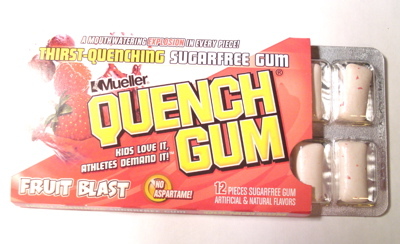 I never thought of Quench as thirst quenching, just great tasting tangy gum. I may try this stuff if I run across it. how good I never tried it but i surly want to!